This is a no-brainer, right? 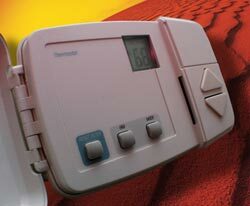 Who hasn't seen and used the thermostat to control how hot or how cold you want your home to be? But nowadays there are many advancements, programmable digital thermostats are completely digital versus the old fashioned thermostat with a side switch dial indicating the temperature. Larger homes and commercial property can require a variety of thermostats throughout the home or building, so each temperature can be different in various areas at the same time. For example, if someone builds a wine room, the room needs to always be between 50-60 degrees. There would need to be a specifically programmed thermostat with that temperature programmed in. Any air conditioning company or air conditioning contractor can come in and install a digital thermostat specifically for this purpose. Digital thermostats are easy to program and offer numerous features, all to provide the very best in heating and air conditioning . And the controversy about how these programmable thermostats are too difficult to program is a myth - technology has created them for a reason: all come with manuals and your air conditioning company can show you how they work. Some programmable thermostats can be programmed up to seven days in advance. It can show the time of day and even adjust to daylight savings time. You can also purchase remotes that can control the temperature in any room from your favorite arm chair. Prices can start from $50 and can go up to $200, depending on your specific needs. Digital thermostats use either a relay or a semi-conduct device called a triac that acts as a switch to control the air conditioning unit. Some even come with touch screens to serve the utmost in convenience. All thermostats contain a thermometer to control temperatures. Normally, thermostats never have to be replace, especially digital thermometers . All come with limited-time warranties. Your air conditioning company can suggest the right thermostat for your needs. Remember to keep your air conditioning filter always clean to ensure the thermostat doesn't get overused. Usually, if you think it's not working, it's because the air conditioning system is dirty and needs to be cleaned.